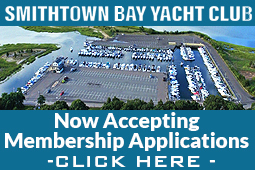 The Smithtown Bay Yacht Club is a private, not-for-profit, member owned cooperative club, with approximately 150 member families. SBYC is located on the north shore of Long Island (N 40º55.319’ W073º10.038’) near the southeast corner of Smithtown Bay. For turfers, you will find us tucked away on a quiet and picturesque peninsula called Long Beach in the Village of Nissequogue, in the Township of Smithtown. The Club has a clubhouse and a marina, both of which have recently been expanded and modernized.